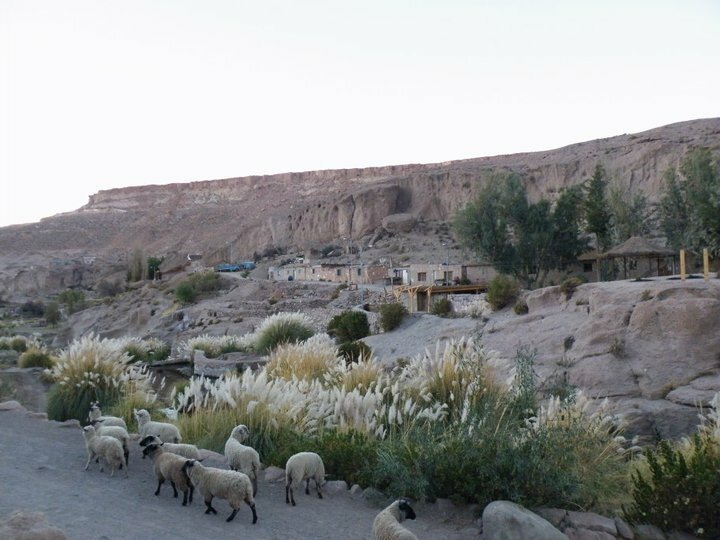 This is the second part of the two-part post entitled collectively “The Atacama Chapters.” Read the first part here. Mario told us the easiest way to reach the geysers from Chiu-Chiu, and it was a small road which led north-west from the town, crossing large spaces of basically nothing and a few very small indigenous towns. So off we went, T and I, to see the fabled Tatio geysers for ourselves. We waited for awhile before getting a ride in a nice little car with a couple of presumed road surveyors, who were focused on a large laptop with some sort of complicated map of the area surrounded by graphs and charts on the screen. They left us twenty or thirty clicks from Chiu-Chiu at a crossroads. There, we waited for a good while. Many cars passed, but all seemed to be taking the other direction where the road surveyors had gone. To pass the time I basically goofed off and enjoyed being in the desert for awhile. After a few hours of waiting, a truck finally passed down our road and stopped for us. We told the workers inside that we were trying to get to the Tatio geysers, and the workers quickly informed us that that would be impossible, due to the fact that the road up to the geysers was blocked with snow. Remember how in San Pedro Paso Jama was blocked with snow and there were about two hundred truckers stuck down in the town? And the Mina Escondita near Antofagasta, closed down? 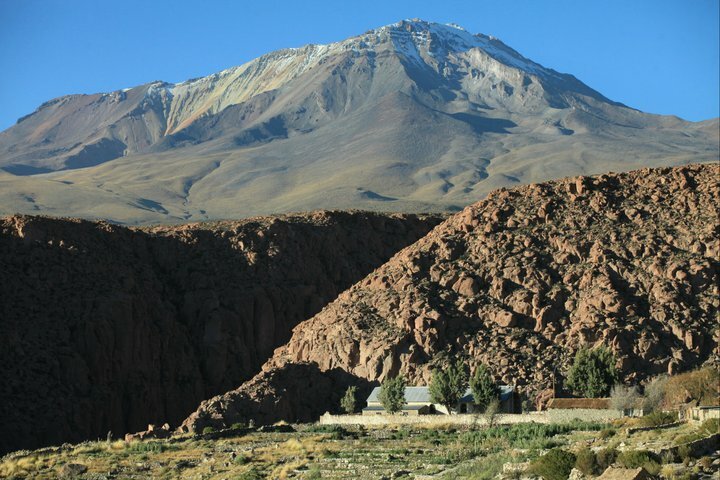 Well, apparently the entire high Andean region between Chile and Argentina had been hit with some of the biggest snowstorms on record, causing nearly all high-altitude routes to be closed down indefinitely. So that meant no geysers for us. We thanked the workers for the information, and sat down to try and decode what to do next. At the end we elected to explore the other route that the road surveyors had taken rather than go back to Chiu-Chiu, since there was a connecting road with Calama further down it anyways; also, there were a few small towns on the map ahead that we hoped would be as nice as Chiu-Chiu. As we were waiting another car passed and took the road towards the geysers, but suddenly stopped upon seeing us even though we hadn’t stuck out our thumbs. “Sure!” we said in unison, and piled into the car, which zoomed off towards Caspana. The driver with the sunglasses was named Ariel, a filmmaker from Antofagasta. In the passenger seat sat Katta, his companion in movie-showing adventure. The two were quite the pair, and T was of course very happy to meet them, her being an itinerant movie-shower herself. We drove for about thirty minutes, down a very twisty road which soon led us into a secluded canyon where was situated the tiny town of Caspana. Caspana, to put it lightly, took our breaths away. As T would later put it, it was probably the most beautiful place either of us had been to in Chile. The town was earth-coloured, so if one unfocused one’s eyes, he would not be able to distinguish the homes from the canyon walls around them. It reminded me vaguely of what I always figured an Adobe Indian town in the States would have looked like. Through the middle of the canyon ran a small river flanked by huge, wheat-like plants with tall, reaching stalks that extended to five metres and more into the air. A few donkeys and goats mucked about by the river while the locals milled about with their daily business. “We’re showing the movie over here,” said Ariel, pointing to a small humble building which nonetheless looked modern when viewed in comparison with the rest of the town. The community centre, apparently. And so we exited the car and walked around a bit to get to know Caspana. We also talked a lot more with Ariel, who reminded us of Hunter S. Thompson from Fear and Loathing in Las Vegas. Ariel was always moving and talking very quickly, and he gave one the impression that he was definitely on something – something you wish he would share with you. On top of that, the glasses and constant cigarette smoking completed the image rather nicely. T and I walked around the town a bit before it was time to start the movie at last. We walked back to the community centre where we found Ariel fiddling around with his projector. There seemed to be very little space on the wall for projecting, so we spent several minutes trying to rig up a sheet to make a better screen, but couldn’t find a way to nail the supports into the stone walls of the room. Finally, we just gave up and projected it onto the stone. Right before the movie began, there were a total of two people there to see the movie, not including T and myself. As the movie played on (French, with Spanish subtitles), the audience was reduced to only me and T. Then, right before the end of the movie, the power cut out. It was nine o’clock, and Caspana’s nighttime generator only runs until that hour. However, Ariel didn’t stay down for long. Ten minutes later off we went in his little blue car to Chiu-Chiu once again, to pick up some of Ariel’s friends and buy some booze for the evening. When we returned a few hours later we were a merry party of six, and set up drinking camp in the same place where no-one had come to watch Ariel’s movie. “Drink up, everyone!” said Ariel cheerfully, and drink we did. Later Ariel procured a little baggie of pot from somewhere, rolled that up into a fat joint, and passed it around. It must have been a very fat joint indeed, because it went around a circle of six people at least four times and left me thoroughly stoned. Along with filmmaking, Ariel was also an avid photographer. He had an extremely expensive Canon camera, which came in a case that looked like it might carry drugs or grenades. 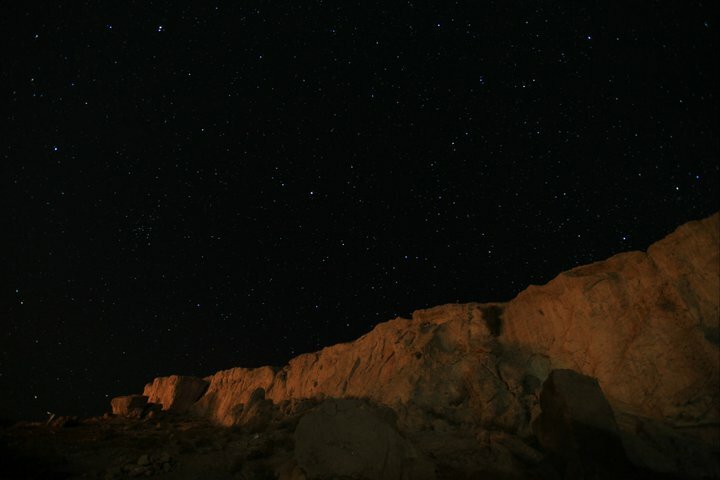 This he used to take stunning photos of the night sky around Chiu-Chiu. We took several very nice group photos around Caspana, which I will share here solely due to the sheer impressive quality of them. Later, Ariel drove us past this same sign during the night. The end result was this photo. The next morning I awoke hung over and around eleven am. Ariel bounded into the room and declared that we were going to Toconce for lunch. “Where’s Toconce?” I asked groggily. So we drove to Toconce, which turned out to be at the end of the road that the road surveyors had taken. We had quite a time finding a place that was open, but eventually found a very nice old lady who served us chicken and rice. She seemed especially sweet to T and I since she actually asked us to name our price for the meal – she wasn’t even a restaurant! She told us she had only served us because we looked hungry and she needed the money. We paid her $3,500 a plate, and she left us nearly $20,000 pesos richer. Sweet old thing, she deserved it. Another shot from Toconce, with a large volcano in the background. After our lunch in Caspana we headed to the nearby town of Ayquina, which Ariel informed us had a population of roughly twenty-five – yet nonetheless had hundreds of houses. Ayquina did indeed remind one of a ghost town. Many houses, even a huge cathedral, but not a soul in sight. Ariel was supposed to be showing another movie here and was trying to locate the keys to the room he would be using. Unfortunately, the owner of the room seemed to be one of those who only came here one week a year, so we were forced to cancel the movie. 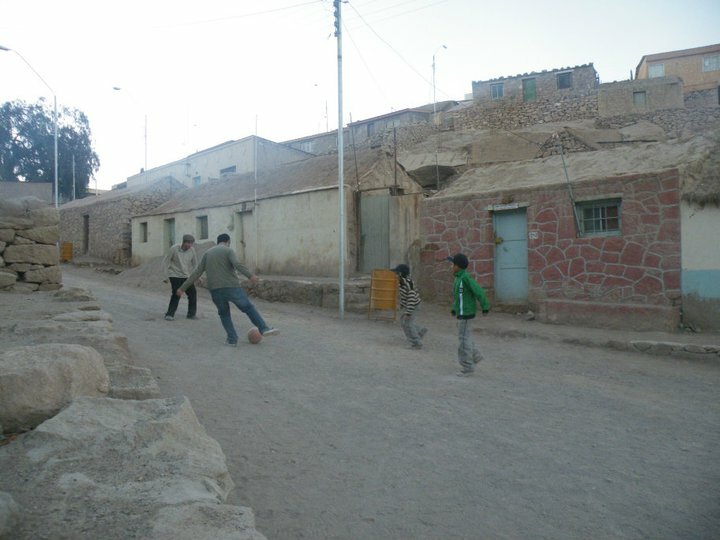 We waited as long as possible, playing a few games of soccer with a few local young boys, who seemed happy to have somebody to play with other than themselves. The boys made several goals against me, much to their ultimate glee and delight. Why do people even ask me to play soccer? 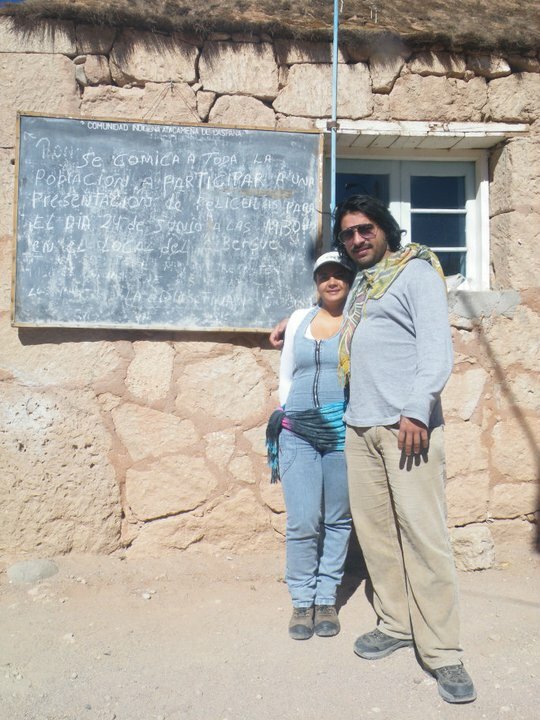 After we left Caspana, Ariel and Katta offered to take us to Calama, where we would be able to hitchhike further north towards Pica and Iquique, our next goals. 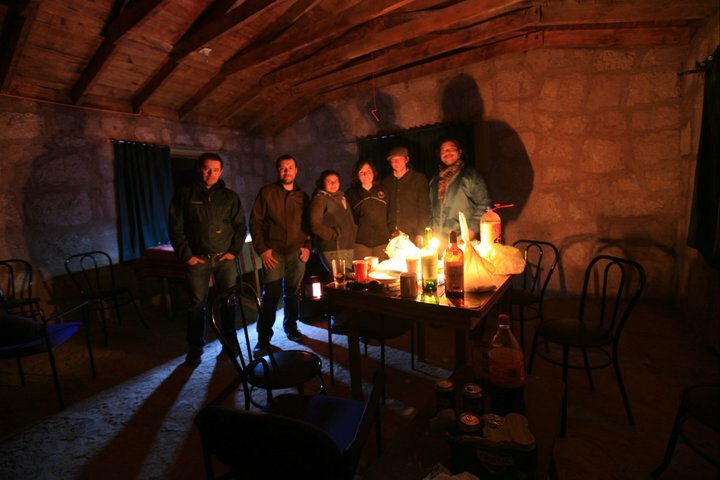 Our movie-showing hosts let us stay the night at a house in Calama they had (well, it was Katta’s father’s house, but it was currently being used by Katta and Ariel). We took a lovely shower and Ariel gifted me a huge number of photos he took of me and T.
The next morning we headed north, ready to hit the hot springs of Pica and the hot streets of Iquique. Ariel drove off wildly after dropping us off at the local COPEC gas station, waving out the window and telling us to call him once we passed Antofagasta. We ended up visiting Pica after all, on the other side of the A-62 which we had tried to take from Ollagüe, and were largely unimpressed by it; still, it did have some nice hot springs and was a natural wonder since it’s a desert oasis which somehow allows its residents to cultivate small, sweet lemons and oranges in the middle of the barren Atacama. We passed Iquique as well, which is like Miami-in-the-desert, with palm trees and high-rise condominiums everywhere. While the so-called “nice” parts of Iquique were hailed by our friend there as the best spots in the North, I personally preferred the hectic downtown area to the steely sharp high-rise architecture of the costanera district. Iquique is a true Latin America port town – like Punta Arenas, but five or six times bigger and in a desert. The downtown area is packed to the limits with shops and little stores of every kind. One will also notice people of all colours in Iquique, notably black Colombians and Caribbean islanders. While perhaps not a strange sight in The United States or France, the sight of a lot of dark skin is a rare one in Chile, where most of the population has a mix or European and indigenous ancestry. Iquique was probably the best example of a Chilean city chock-full of immigrants from other South American countries. The noisy, bustling downtown had few skyscrapers but many, many street markets and people of all colours walking around, shouting, and laughing. I found this melting pot of rowdy cultural mixing to be extremely enjoyable, and filed away Iquique as a nice place to stay and work for awhile in Chile if I ever felt like it. T and I camped on the beach on numerous occasions in Iquique, enjoying ourselves and watching people hang glide off the nearby coastal mountains down to the beach. After two days we headed back south, as T needed to be back in Santiago around the beginning of the month so as she could meet her sister, who would be visiting Chile from France for about a month. Hitchhiking south along the coastal highway from Iquique proved to be quite easy, and we found ourselves headed to Tocopilla in short notice. Our driver was extremely chatty and seemed to be glad to have some company, though he made a few jokes about T and I that I didn’t find very funny. We drove for awhile until stopping at a customs checkpoint about 30 kilometres south of Iquique. Due to the fact that Iquique is a free port, the Chileans have set up a lot of customs checkpoints around the city. This is because some things bought in Iquique cannot be taken into the rest of Chile until a certain time – for example, cars. A car can be purchased in Iquique for nearly half the price as in the rest of Chile, so in order to keep sales up in other parts of the country the Chilean government requires the car to stay in Iquique for about five years before it can be brought into other regions. At the checkpoint we ran into a couple of problems, mostly because our driver had picked us up. The customs lady was giving him a very hard time, and she made us get out and empty our bags, apparently to make sure we hadn’t stolen any electronics from the Zona Franca. Finally after almost an hour, we were allowed to continue on. We wanted to get off somewhere before Tocopilla in a caleta (small fishing town). Our driver informed us there was a perfect one about 30 kilometres from Iquique, so we decided to get off there. 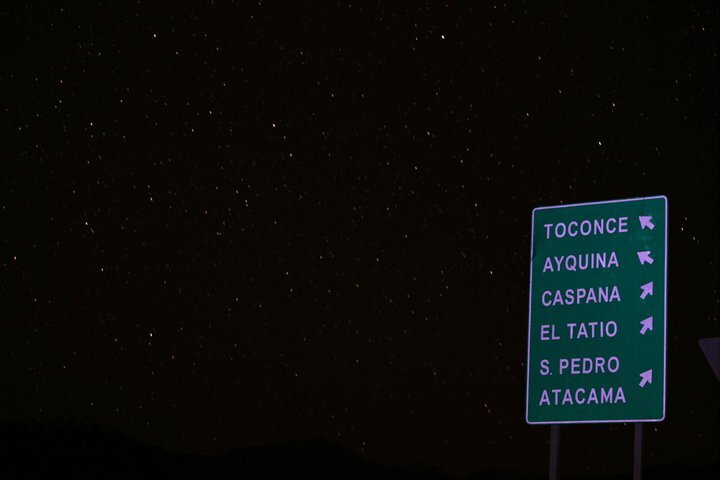 Unfortunately, when we were passing by the area where the caleta was supposed to be it was dark – consequently the driver missed it, and soon we were in Tocopilla. The trucker offered us his house for the evening, apparently feeling bad for missing our stop. I suppose he wasn’t so bad after all. The next morning T and I continued riding with the same trucker (who, it turned out, was actually heading for Antofagasta), and he dropped us off in another caleta very early that morning about twenty minutes south of Tocopilla. After getting a few hours more sleep, we went out in the mid-morning sun to explore the town, which was called Caleta Indigina. Caleta Indigina was deserted. There were a few concrete homes and several boats bobbing around in a small harbor, but there were no people in sight. Well, we weren’t looking for people, so T and I went off to explore the coastline. 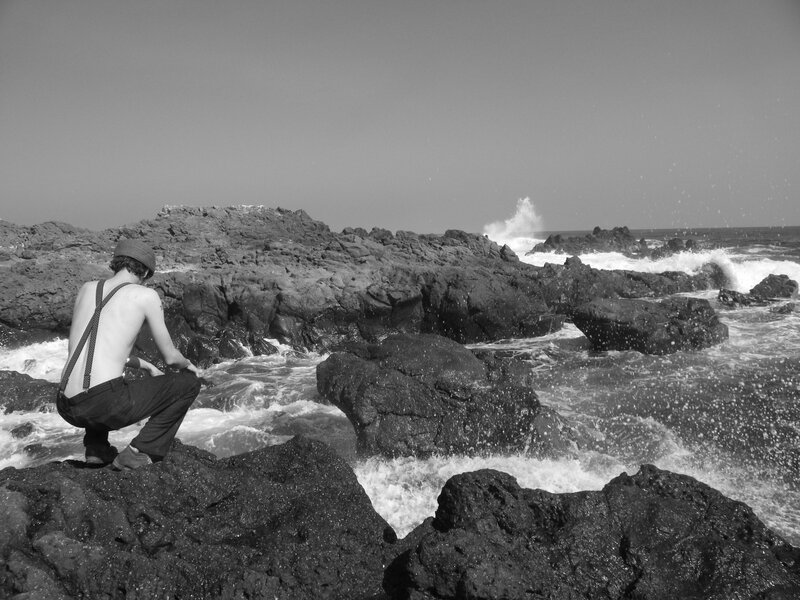 There was no beach to speak of, only rocky coastline full of tide pools. The sea arrived in tremendous waves and smashed into the rocks with awesome force, causing water to spray into the air five metres or more. When a wave would recede we saw hundreds of tiny fish stuck to the side of the wet rocks, presumably using some sort of suctiony mouth. I spent several hours trying to capture one, until finally succeeding around noon or so. In addition to the strange rock-fish, there were lizards everywhere. Unfortunately, they were extremely fast and crafty, so I wasn’t able to catch one to see it up close, though it certainly was not for lack of trying. In the tide pools around the lizard’s hangout were crabs, many-armed starfish, small fish, and clams. We spent a good part of the afternoon there at the tide pools before continuing south around three pm. A pickup soon stopped for us and drove us for a few hours to the town of Mejillones, about half an hour north of Antofagasta. Mejillones at the moment is a mostly quiet small port, though it won’t be for long – in twenty years Chile will have finished converting it into a megaport, one of the largest on the continent. The signs of development are slowly arriving to the town of 10,000; it is home to an electricity plant which supplies the entire Mina Escondita with power. T and I stayed in Mejillones for two days; T wanted to get a room to rest and shower, so we did, and spent our time watching a local religious festival and enjoying the beach. 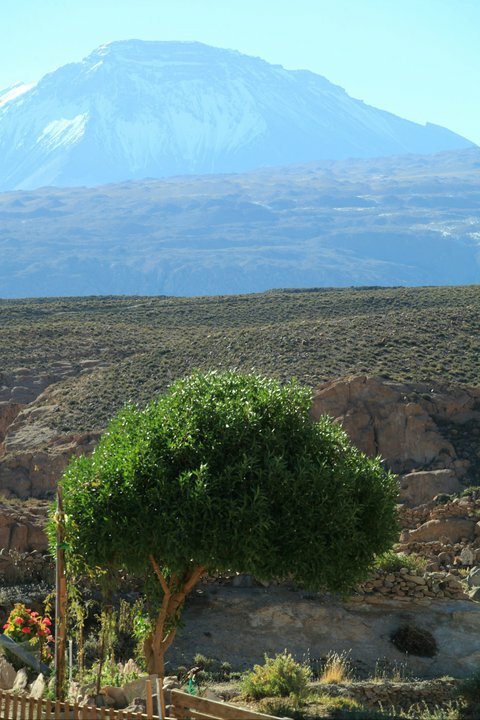 Then it was to Antofagasta, where we hoped to meet up with Katta and Ariel once more. Before getting into the downtown, T and I stopped to see up close a huge rock formation known as “the symbol of Antofagasta.” Known locally as “La Portada” (The Potral), this huge, random arch in the sea was formed by natural causes and now spends its days eroding away, being photographed, and getting pooped on by tens of thousands of seagulls. We hitched one more ride into Antofagasta and found ourselves in the local mall, where I noticed that Ariel had replied to my email and was inviting us to his home in Antofagasta. After seeing a movie ( a common occurrence when you are spending time with the lovely T), we met Katta outside the mall and she drove us to Ariel’s house, where we drank a few beers and watched some of the movie material Ariel had created. These included a few music videos for local bands and a very nice short film. Since Ariel was spending time with his new squeeze, T and I gave him a little space and slept with Katta for the evening. The next morning it was a nice lunch and a heartfelt goodbye to our filmmaker friends before starting our hitch to La Negra and Taltal. 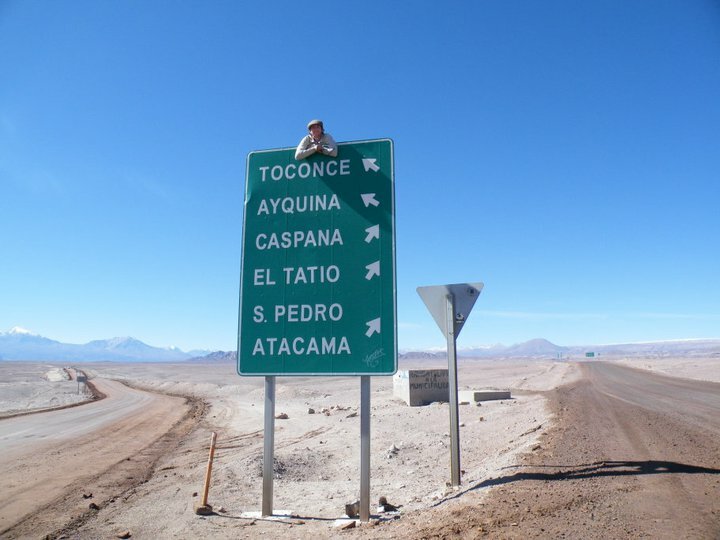 We had rather bad luck hitchhiking out of Antofagasta, and I think it was mostly due to poor selection of hitchhiking spots on my part. A guy with a guitar got a ride in about ten minutes waiting about twenty metres in front of us at a stoplight. Then, not three minutes later, a pair of middle aged hippies went to the same spot and got a ride almost immediately. T and I were rather upset that all these people were coming by and ruining our hitchhiking, and vowed to catch up. We went to the spot where the hippies had gotten a ride and soon found ourselves in a fast little car with a pot-smoking driver who quickly passed up the hippies in their slow semi truck. I waved my hat out the window at them to show that we had won, after all. Unfortunately, it seemed our driver would only be taking us as far as La Negra….and the hippies were bound to catch up with us! Feeling a sense of healthy hitchhiking competition, T and I walked as fast as we could south from La Negra, hoping to get a fast ride to Taltal (our next destination), before the hippies arrived in their semi truck. But too bad, so sad, the hippies caught up to us, and I saw one of them flashing a V for Victory sign at me as the semi passed us by. But there was still hope! The semi dropped them off just ahead of us, and now we had a chance to flag at all the trucks coming by before they could – just like they had done to us in Antofagasta. It was quickly becoming dark, and at that moment it was a real race. Every time a truck passed T and I would signal wildly; when it didn’t stop, we prayed that it didn’t stop for those two bastards in front of us. Finally, just as it was about dark, a stopped semi agreed to take us to directly to Taltal. T and I were feeling pretty good as we passed the hippies thumbing desperately at us. I flashed the V for victory, and immediately afterward, the L for Losers. T and I had won. But at what price…? The Crazy Camionero (“camionero” meaning “trucker” in Spanish) started off sane enough. But that semblance of sanity didn’t last for long; before we had even turned off the highway to Taltal, he was concerning us greatly with a story about a huge crack on his windshield which had apparently appeared just one hour ago when he had accidentally fallen asleep. This alone should have raised a number of red flags, but again, we were still happy to be going directly to Taltal from La Negra. As we turned off the Ruta 5 and onto the relatively new road to Taltal, we passed long stretches of straight. The Crazy Camionero had apparently dubbed these stretches of highway as some sort of “sleep sector,” and treated it as such – the man went to sleep while he was driving! When T asked him just what the hell he was doing driving with his eyes closed, he told her that “when I arrive to a long stretch of straight road, I can sleep a little because I know I can wake up in time.” Judging from the crack in his windshield, that system was far from 100%. As the road continued on we began to travel along a long sector of the road that was just one long decent, fraught with dangerous curves and precipices. And since we were going down an incline, he allowed his truck to rip down the slopes at more than the speedometer could even count to. More than 140 kilometres per hour, in a two-ton big rig – the man was insane! At one point, I made the mistake of asking the Crazy Camionero if he had a lighter. Big mistake – the loon simply responded, “Why yes, of course!” took both hands off the wheel and went rummaging around in his glove compartment while the truck motored on! And as he was looking, lo and behold there was a huge turn with an evil cliff on the other side. The Crazy Camionero only just barely managed to correct in time to save us all from dying a fiery death on the rocks below. The last part of the ride was the worst. Ten kilometres of hairpin turns as the road evened out into the coast. The turns were marked at thirty kilometres per hour MAX, and here the Crazy Camionero figured such rules didn’t really appy to him and took them at 60. T and I were digging our nails into each other’s hands, gritting our teeth and wondering if we would live to see another day of hitchhiking. Finally, we screeched into Taltal an hour later, T and I completely drained and exhausted from the force of fear two and a half hours with the Crazy Camionero had brought us. We staggered away from the truck, gasping, and wondering how we had survived such a perilous journey. When we arrived into the downtown, we found the entire town to be almost deserted. The reason? Chile’s first soccer match in the Copa America against Mexico. The reason the Crazy Camionero was so crazy had become clear. Soccer. Simple as that -he didn’t want to miss a single minute of the match. And for that, for a silly game, T and I nearly crashed and burned down the side of a dry mountain in northern Chile. Welcome to Latin America. Soccer is King. All others stand aside. After one day in Taltal, T got a very urgent, family-related message and needed to go back to Santiago as quick as possible. The next day she jumped on the first bus back south and told me to meet her there as soon as I could. I did so, hitchhiking down very quickly to Viña del Mar before getting back to Santiago the next day. Here started a long, several month stay for me in the Chilean capital. I made a quick trip to the south to Quinahue el Boldal to say hello to my Chilean family before going back to Santiago and staying there for about two months. Here’s what was going on: T had found a good job as a marketing engineer in Santiago, and was planning on staying for awhile, until at least December. I decided, after spending a few weeks at a time away from her when I was in Quinahue, that it was better for us if I stayed in Santiago with her. And so we rented a small room in a bohemian household smack-dab in the city centre, where our immediate neighbours were a professional Taro card reader, a pair of cookie-baking lesbians, and a young man with an impressive collection of quickly growing pot plants. We stayed there for a month while I looked for a job. Finally around the middle of August I found one with the British Institute, giving English classes to businessmen all around the city. However, I felt myself growing more unhappy with each day I passed in Santiago, despite the fact there were many interesting riots and protests going on, with tear gas and water cannons and everything. I will detail this and other things that happened in Santiago in a separate piece of writing, to which I will put a link here once I get around to writing it all down. The bottom line was, I was not enjoying myself. I was spiraling downward. I would spend days at a time doing absolutely nothing. I had no motivation to do anything or go anywhere. I was completely bogged down. Even though I was with T, I felt more and more trapped each day I spent in Santiago. One day it all came to a head; something had to change. T and I talked it over and decided it would be best that we continued our separate ways. It was not a breakup rife with hostility – rather, we left on good terms and both felt a little relived and liberated after it was all said and done with. Now I was free to leave Santiago and pursue my own interests. I cannot say that I am not going to miss her very much – if I did it would be a lie. 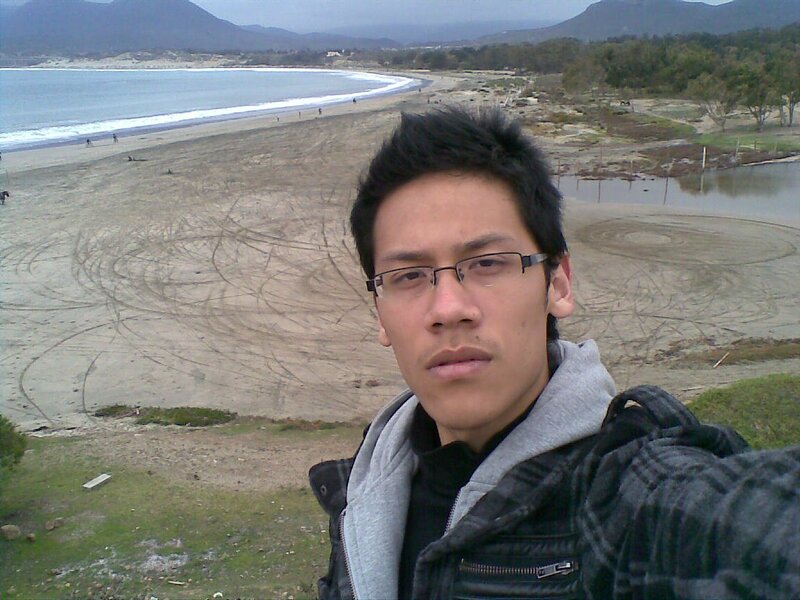 In late July I got an email from a Taiwanese-Chilean young man who was living in Santiago. Tony had read much of this site and felt he wanted to meet me. I agreed, and it turned out we got along famously. Tony’s main motivation for contacting me was the fact that he was planning a hitchhiking trip of his own to Europe, and wished to speak with me for advice. I promised him I could tell him only of the places I had been to, but he said he was just looking for more hitchhiking advice; he needed someone to show him the ropes, so to speak. I gladly did so. We made our first short hitchhiking trip to Viña del Mar in early August, and our second, longer one to Constitutión a few weeks later. I taught him all the road survival tips I knew, and he ate the information hungrily up. There will soon be a post under “Interesting People” titled “Tony” with the details of our first trip to Constitutión and resulting friendship. Tony likes to describe himself as my “Padawan learner,” and I must admit I quite like the term, since it makes me feel like a hitchhiking Jedi Master. After T and I called it quits, I told Tony that I was leaving Santiago and headed for Brazil at last. If he wanted to come, he may do so. But he must understand that he will be gone from his home for a long time. Due to the fact that my Asian friend had spent a large portion of his life away from his family (half his life in Chile, half in Taiwan), he had no problems leaving what little family he had in Santiago behind and hitting the road with yours truly. And so, early tomorrow morning Tony Tung and the Modern Nomad head north out of Santiago, with the wilds of Brazil and English Guyana set in our sights. Now, if you’ll excuse me…the road beckons.